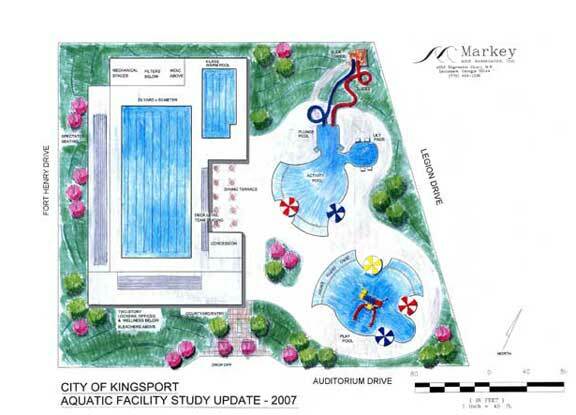 Feasibility Study, Master Plan | Markey and Associates, aquatic design consultants. Top rendering is an update of previous Feasibility Study we did for them in 2002. The 2007 feasibility study update shifted the emphasis of the project to include a major indoor competition facility. The original 2002 work involved an evaluation and needs assessment for the two existing pools, known as Legion Pool and Riverview Pool, and then a feasibility analysis for a more comprehensive outdoor recreational aquatics facilities. This is now an active project for building the facility and is expected to be completed in the Fall of 2010. In February 2009, a team of Markey and Associates and Lose & Associates of Nashville was selected to provide complete A/E services for the facility as shown above. Early design decisions are being made as to adding an Indoor Leisure component and possibly an outdoor Lazy River. Planning and Design of the aquatic aspects by Markey and Associates in association with Lose & Associates.